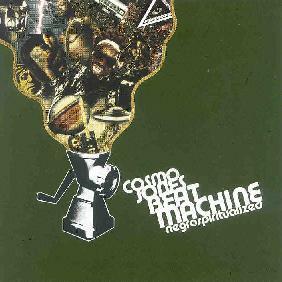 Cosmo Jones Beat Machine - "Negrospiritualized"
Coming from the cold forests of Finland, the Cosmo Jones Beat Machine takes the genre of blues into places only they can. The musicians are Pekka Pirttikangas: Vocals and Guitar, Marko Lukkarinen: Vocals and Guitar, El Bubbles: Percussion and Things, JP Hautalampi: Drums and Paul Staufenbiel: Keyboards. Together they create a very furious paced, up-beat blues that jumps headlong into the genre without a thought for the mainstream. There are hints of Captain Beefheart, in fact many of the vocals sound in that Beefheart rant style. The music is not quite Beefheart but on occasion that beat blues vision he had can definitely be heard. Negrospiritualized is a twelve track CD that lasts well over forty minutes. It jives and swings, it rocks and rolls, and it rants with catchy hip thrusting grooves. Cosmo Jones Beat Machine have got a definite style of their own, you can delve into Beefheart delta slide stuff with "Voodoo Audio Blues" and "Smilin Snakes", these tracks are very close to Beefheart indeed, that growl of his springs from the speakers, the sound is near perfect and no doubt this will appeal to fans of his. "Jesus Don’t Mind My Drinking" is a cracking song. Very in your face. There are links to Zappa here and there. "Preaching The Gospel" musically could be Zappa as well as Beefheart. Those two influences alone make for interesting music creation. I have no idea if they hold Zappa/Beefheart as an influence, but I can hear definite elements in their music regardless. For the spacey side of things, stuff like "Hellbait" is in a Nucleon vein, it is uncanny. On the whole, if you are a out of it blues freak, one who is familiar with the works of Beefheart/Zappa or maybe like a bit of new blues or something then give it a try. For more information you can visit the Hot Igloo web site at: http://www.hotigloo.com.